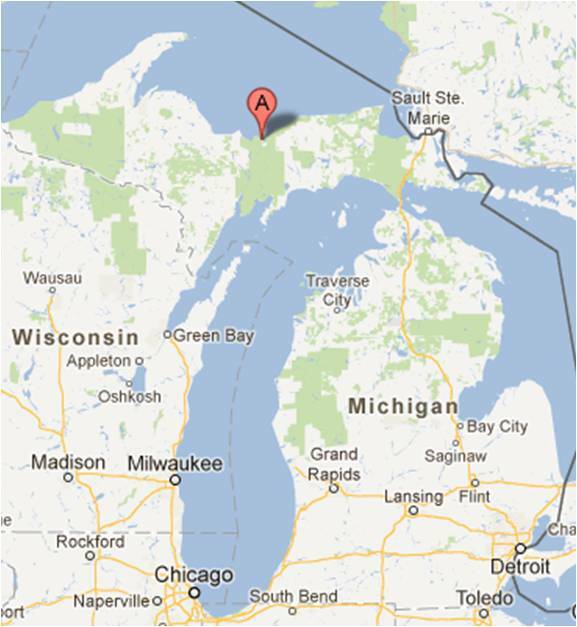 In my opinion, the Upper Peninsula of Michigan is only place in the state where you can experience true wilderness. The Pictured Rocks National Lakeshore between Munising and Grand Marais are a stunning example of nature’s beauty. The cliffs along Lake Superior are viewed by thousands of visitors every year. You can see the cliffs from tour boats, by kayak or canoe, or from hiking trails along the cliffs. 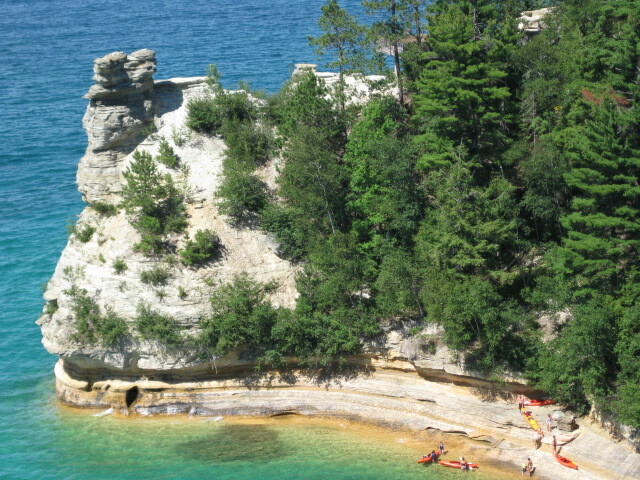 The Pictured Rocks National Lakeshore includes acres of wilderness inland from the lakeshore and miles of hiking trails, including a segment of the North Country Scenic Trail. Backcountry campgrounds are accessible by foot or boat. 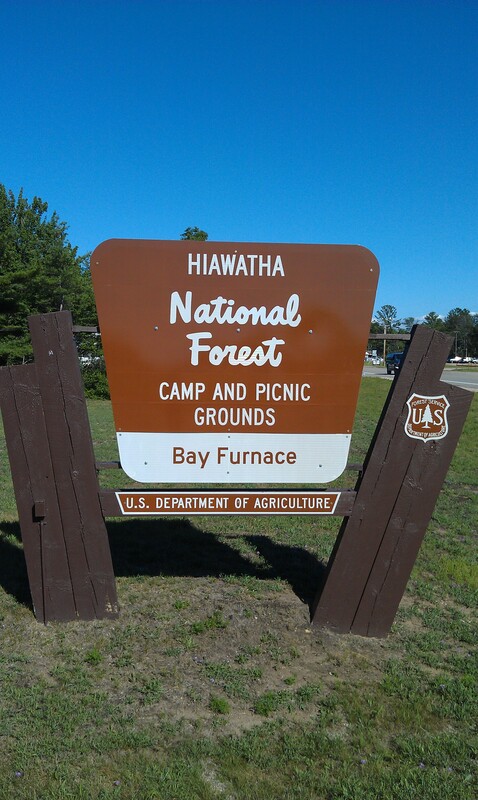 We stayed at the Bay Furnace Natural Forest Campground, just west of Munising. There were no hookups for electricity and water and we were in our dry camping mode. The campground was quite nice, with lots of trees between sites. Most of the sites were deep enough to handle a trailer of our size. 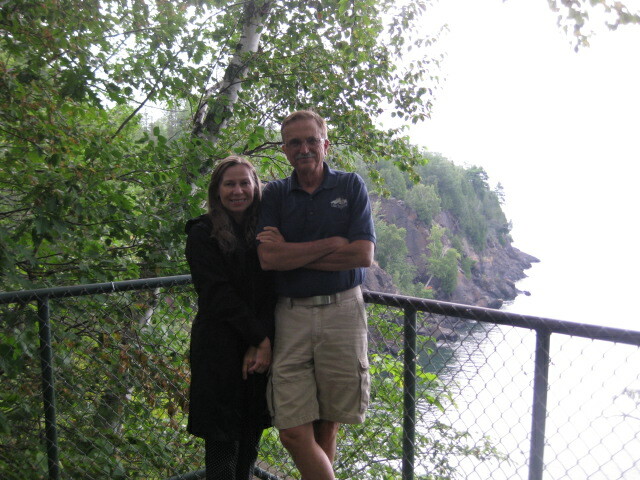 Some of the sites were right on the bay, with a clear view of the Lake Superior and Grand Island. Munising was the site of many iron ore mines, and was the major industry in the area for years. Along the lakeshore the companies had built huge furnaces to melt the iron ore for shipment and for local use in making tools and other implements. One of these old furnaces has been partially restored and is in the Bay Furnace campground. We would recommend this campground to anyone coming to the area. Bob has backpacked in the Pictured Rocks three times (once with Pat as his hiking partner) and wanted to return to the area. Surprisingly we spent more time on the water than we did hiking. 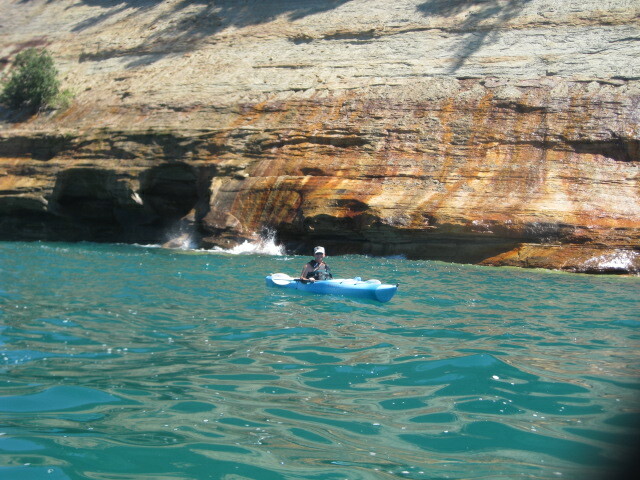 We went to a rock formation in the Pictured Rocks called Miner’s Castle. 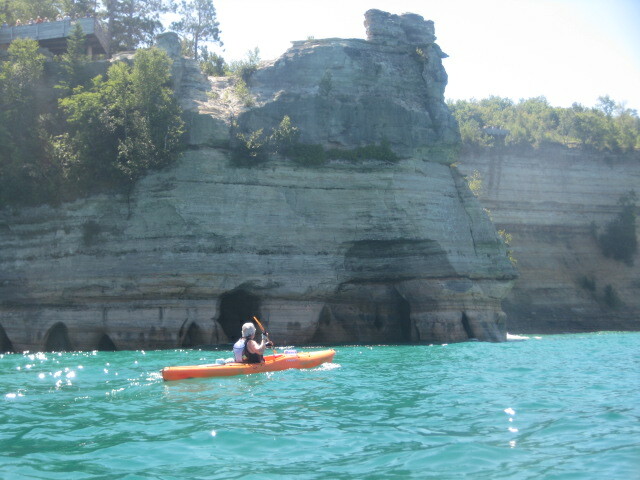 We launched our kayaks from nearby Miner’s Beach and paddled around Miner’s Castle and along other cliffs. The trip was a bit challenging as we paddled in waves up to three feet high. Lake Superior can be very unpredictable and strong winds and high seas can occur with little warning. There are many places along the lakeshore where the sheer cliffs will not allow you to beach your kayak if you get into trouble. You are strongly encouraged to paddle out in the lake with only the proper equipment. Our kayaks were not made for this sort of environment, so we stayed close to the Miner’s Beach area. We stopped for lunch on the beach and went swimming afterward. The heat wave we had been experiencing made swimming in Lake Superior more pleasant than you would normally expect. Bob had heard about how good the SCUBA diving was in the Alger Underwater Preserve and made arrangements to dive on two wrecks, the Steven M. Selvick and the Bermuda. The water was clear but VERY cold. It was 500 at sixty feet underwater on the Selvick and still cold at thirty feet down on the Bermuda. The shallow dives allow you plenty of time to explore the wrecks, but the cold water didn’t encourage you to stay underwater too long. While in Munising we drove over to Marquette to have dinner with one of Bob’s friends from the National Guard, Fred Stonehouse. We had dinner at Vierlings, a refurbished “Sample House,” that had some of the best and freshest white fish we had ever eaten. Fred is an author of several books about the Great Lakes and is a Marquette city councilman. He and his wife, Lois, are certainly proud of Marquette and gave us a personal tour before we left. There are several waterfalls in the area and a brochure available in the Interagency Visitors Center in Munising gives detailed directions to each one. We explored several in the area and it was surprising how a small stream can create a significant waterfall. Our last full day was spent kayaking on the Au Train River. This is a very popular river and was pretty crowded at the bridge from which we launched, although the crowd cleared quickly and we had a very pleasant time on the river. The Au Train River winds in an S-curve on its way to Lake Superior so it was easy to drop off Pat with the kayaks at the bridge, have Bob park the truck at Lake Superior, and ride his bike back to the launch point. 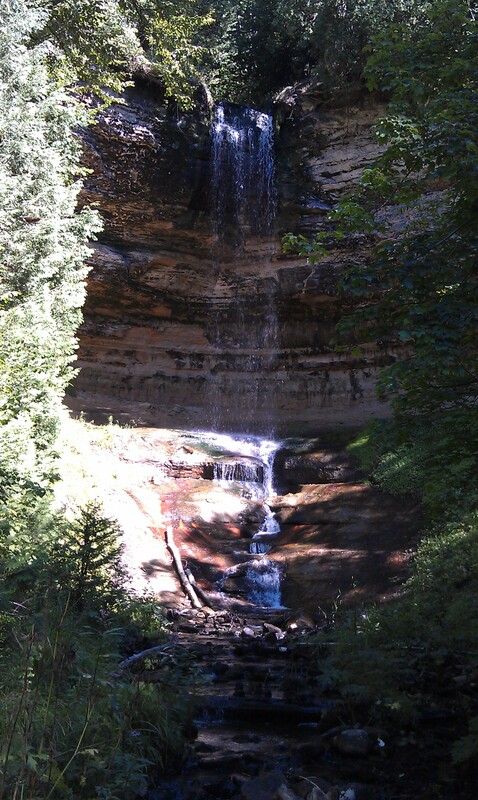 Munising and the Pictured Rocks were a great place to visit, and now we are on our way to the Porcupine Mountains Wilderness State Park. This entry was posted in Fulltime RV, Michigan, Michigan Traveler and tagged Bay Furnace Campground, fifth wheel trailer, Frederick Stonehouse, full-time RV, fulltime RV, Kayaking, Lake Superior, Miner's Castle, Pictured Rocks National Lakeshore, RV Forums, SCUBA diving, Vierlings. Bookmark the permalink. Hello I work with Lois Stonehouse at Marquette Twp. She sent me a couple of your links. I really enjoy your posts, very informative. Fred and Lois are great. I’m glad you are enjoying the posts, we put these posts out there so people will be encouraged to visit some new places. And to record our journey.